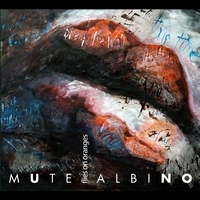 Review: "Mute Albino: Flies on Oranges" - Sea of Tranquility - The Web Destination for Progressive Music! When we receive CDRs slipped into homemade paper envelopes, we're always a little leery about what we're about to hear. But the 37-and-a-half minutes of moody music on Flies on Oranges � an 11-song demo by one-man Belgium band Mute Albino � left us nearly speechless. In a good way, despite some odd production quirks that allow for mid-song fades and abrupt, incomplete endings. Stip Vanstiphout may or may not be an albino, but he doesn't sing � which would make his musical alter ego an apropos name. He lets his guitar do most of the talking here, with dreamy and visual songs that boast captivating titles like "Therapeutic Depression" and "Welcome to My Head." From the spacious guitars on "Elsie's Philosphy" (reminiscent of David Gilmour) to the heady fusion-istic title track to the heavy undertones of "The Mole's Vision" (the album's most cinematic cut), Flies on Oranges is an unexpected treat.